First off, one needs to understand that when they're dealing with Mr. Bossi, they're dealing with a force of nature. 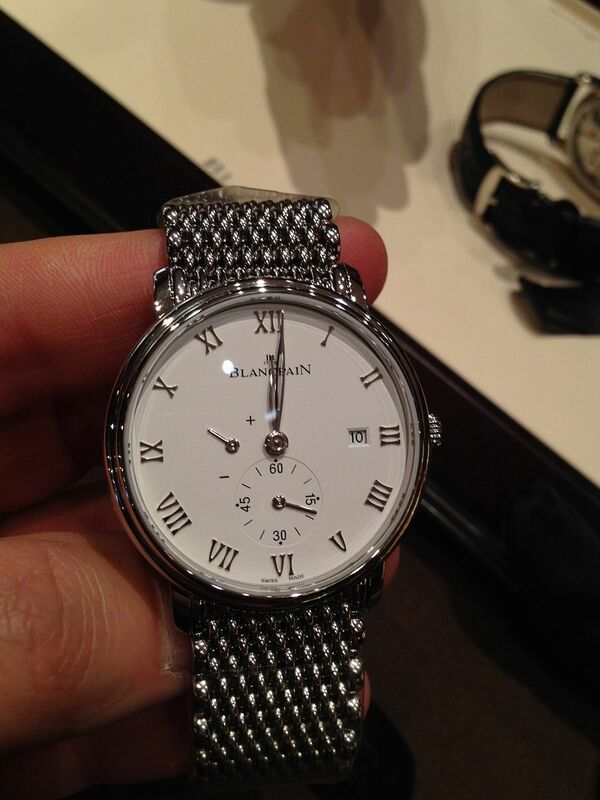 His enthusiasm for Blancpain is only barely contained within the confines of his well-tailored suit. There are a number of reasons for this, not least of which being that he's a career watch guy, and one who has truly worked his way up through the ranks. He's seen it all and done it all. 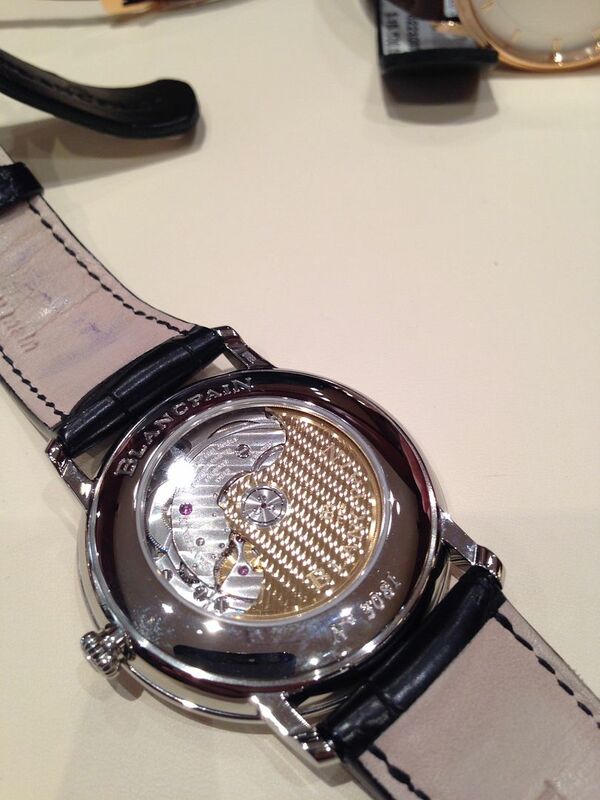 What's more, he genuinely loves watches, which, believe it or not, isn't necessarily a prerequisite for this industry. You'd be surprised how many executives come from jewelry, handbags, etc., and have only a passing acquaintance with horology, but I digress. 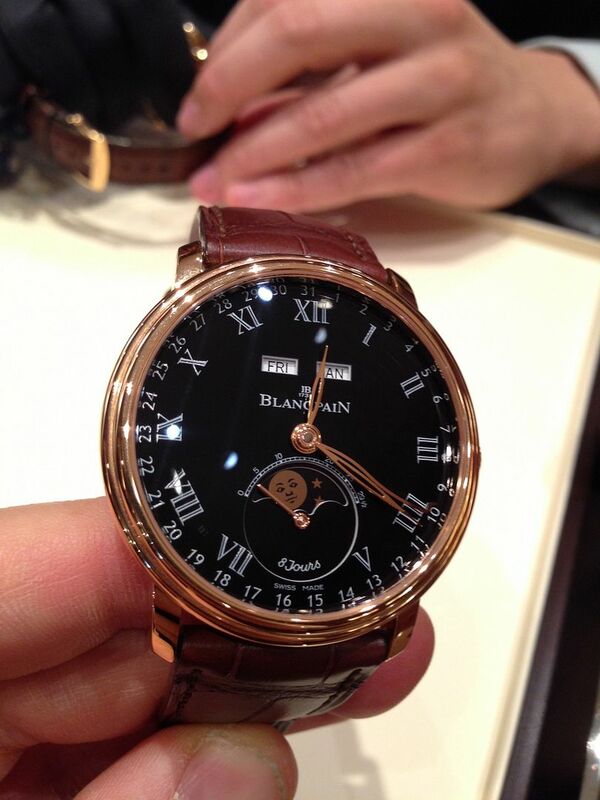 As I mentioned above, my visit to the boutique was to get a crash course on Blancpain, and that's exactly what I received. 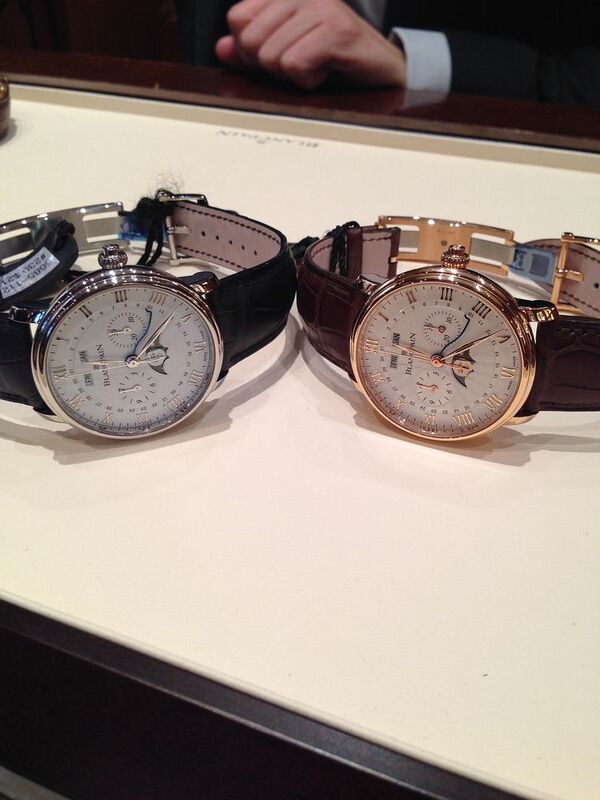 We kicked off the meeting with a look at their Villeret line, which encompasses everything from elegant three-handers to full-blown tourbillons, perpetual calendars and more. 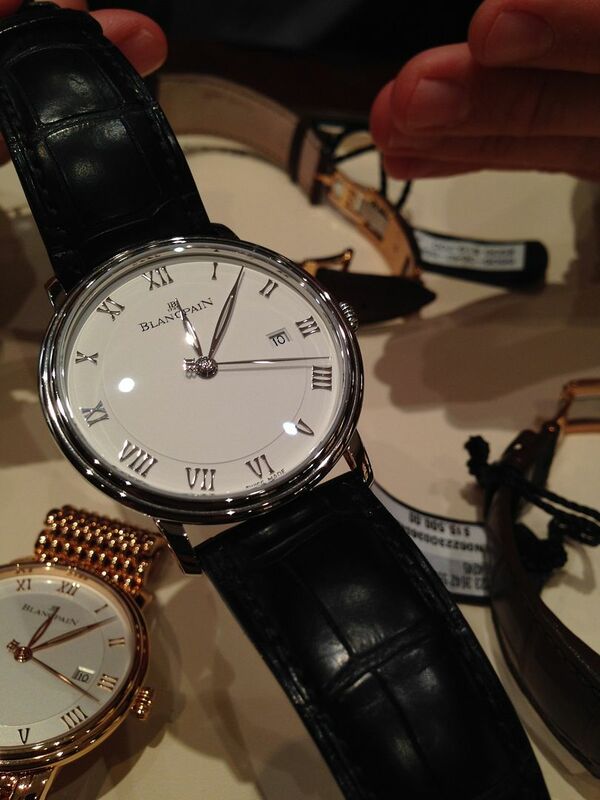 This is a supremely elegant piece with modern proportions that take the case from 38mm to 42mm. While I think that it's safe to say that most purists would prefer the smaller case, the updated piece actually remains quite well-proportioned on the wrist. 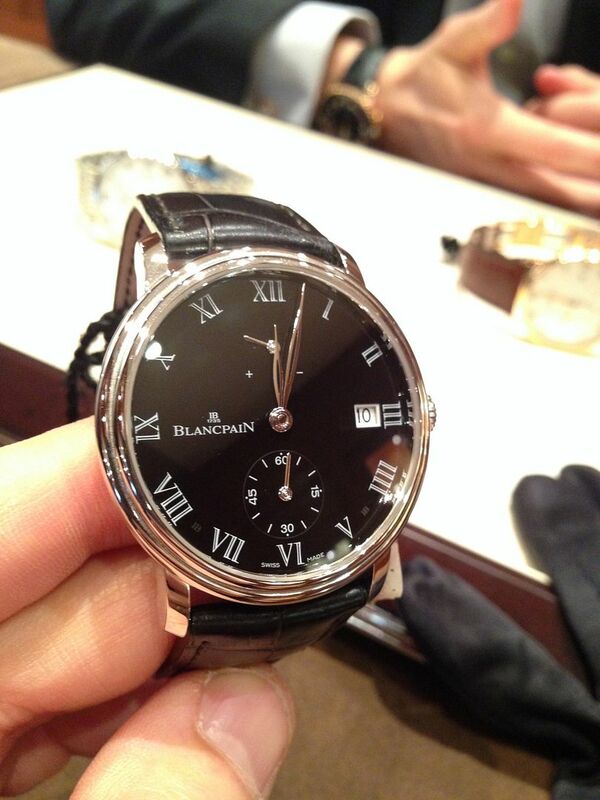 In addition to the larger case size, the newer model also features a new counterpoise on the second hand that features the Blancpain logo. 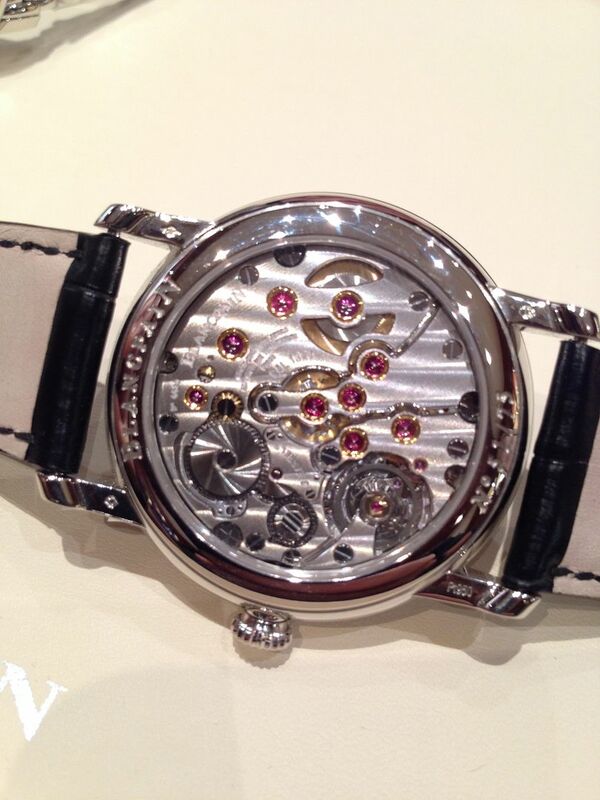 The movement is the classic c.1150, which features a generous 100hr power reserve. 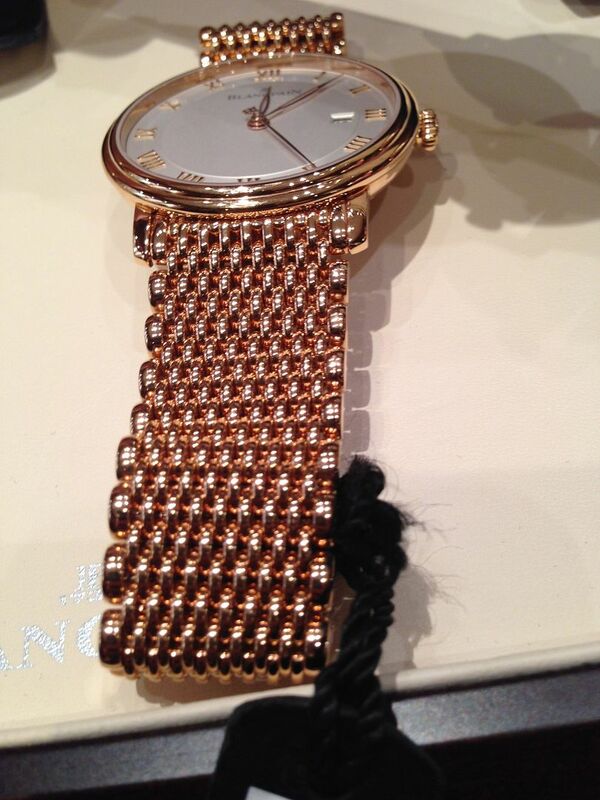 This watch was produced in a series of 75 pieces, and again, its subtle elegance belies its presence. The jet-black dial and applied Roman numerals conspire with the expertly polished case to create a singularly lovely vision on the wrist. 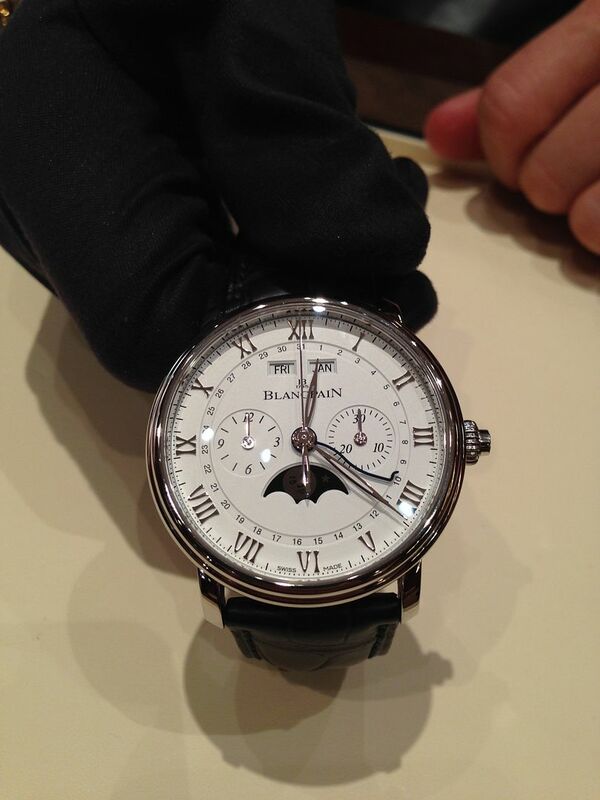 As is evident from the name, this piece sports a full calendar, replete with a moon phase. 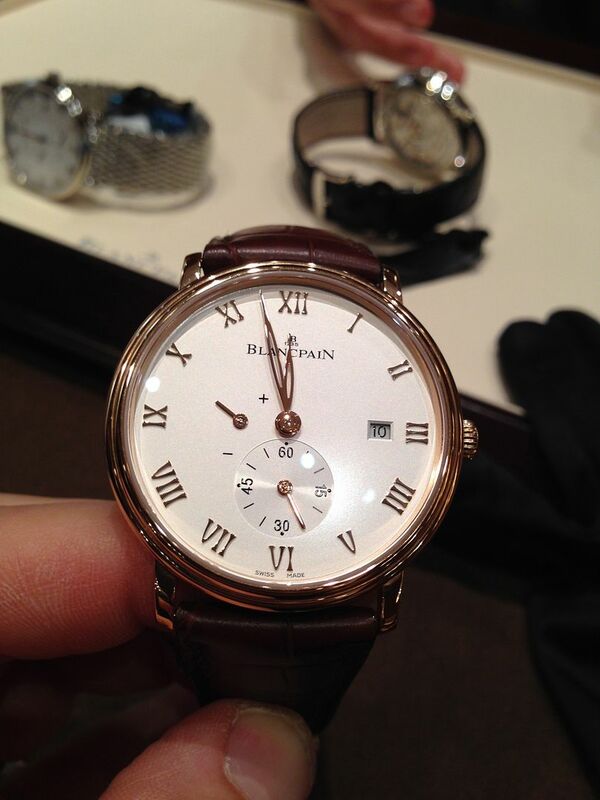 The dial is rendered in grand feu enamel and the 42mm case can be had in 18K red gold, as well as platinum, with the latter being limited to 75 pieces. 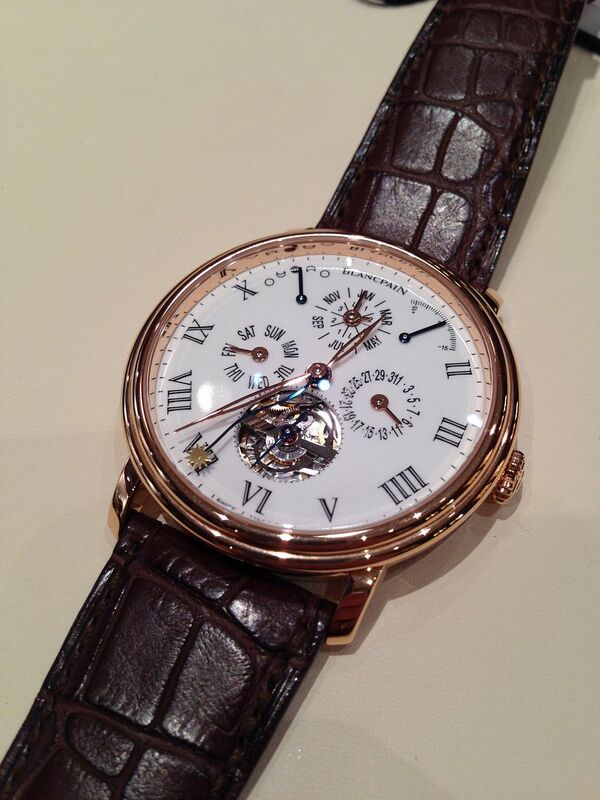 What you're looking at is one of my favorites, the Villeret Chronographe Monopoussoir in steel. Just, wow. Like the 8 Day Full-calendar, this one also features day/date/month indicators and a moonphase, as well as the trick under-thelug correctors, but it goes one step further with a mono-pusher 12-hr chronograph. Date? Check. Retrograde small seconds? Very cool and yes, check. 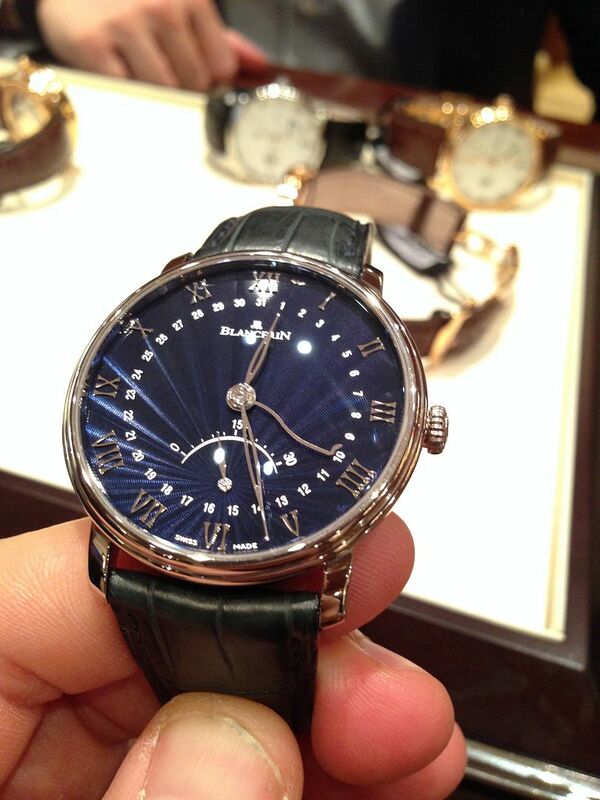 Insane blue lacquered "flinqué" dial? Mega-check. What can I say, I'm a sucker for a blue dial, and folks, it really doesn't get much better than this. Once more, I have to apologize for the fuzzy image, but even a professional photo won't properly convey the depth of this dial. Seriously, you can get lost in it. 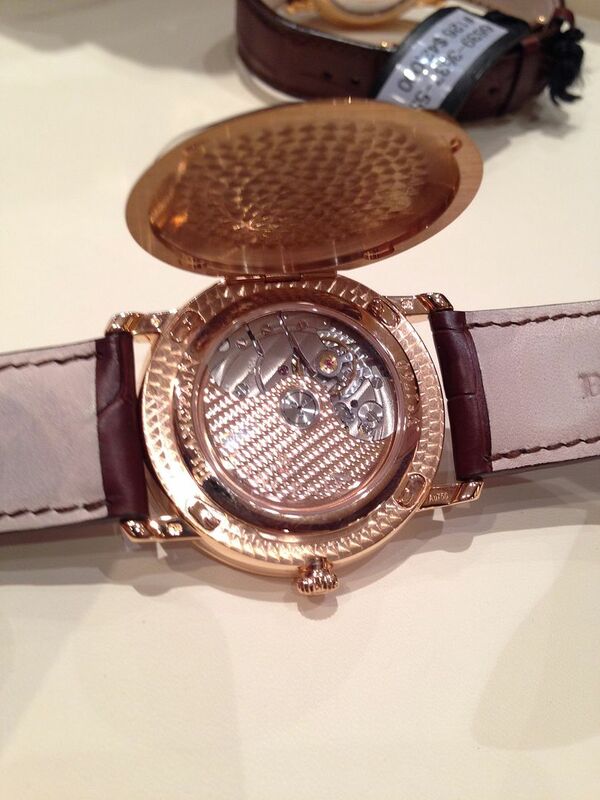 Aside from being flat-out gorgeous, it presents a characteristically innovative approach to a dual-time watch. 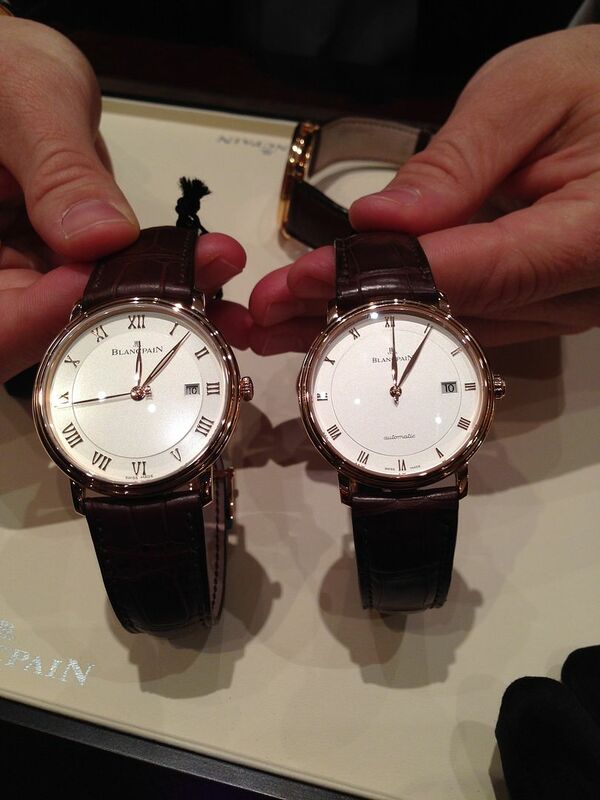 As you are no doubt aware, most dual-time watches do not allow one to account for half-hour timezones (such as, say, India), but see that pusher set into the crown? Yup, push it, and your second timezone will jump in half-hour increments. The D and T indicator allows you to easily set the date or time, and of course, the day/night indicator is always a handy feature on a watch like this. 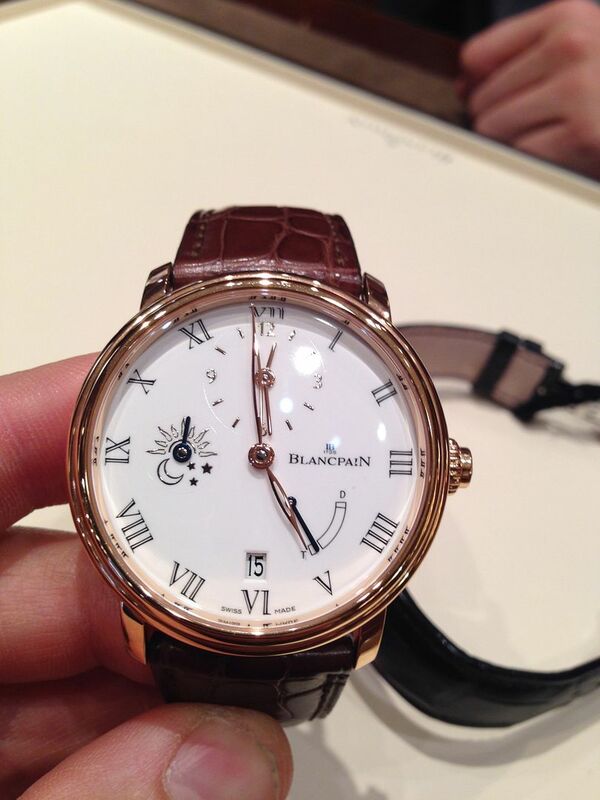 It is available in steel, or in 18K white or red gold, with the precious metal variants also featuring grand feu enamel dials.